Fuster (José Rodríguez Fuster) #6509 ""Solo la luz," N.D. Glazed clay sculpture. 9.5 x 2 inches. José Rodríguez Fuster (Fuster) was born in Villa Clara in 1946 and lives in Jaimanitas. 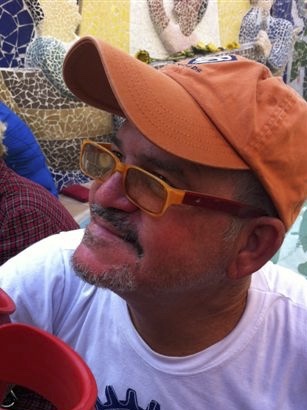 He is one of Cuba's most original ceramists and popular painter. He paints, engraves, and sketches and began his artistic career in 1961 at age 14 when he traveled to the Sierra Maestra to teach in the Literacy Campaign. He studied at the Art Instructors School from 1963 to 1965 and then started working as a ceramist at the Cubanacán Ceramics Workshop in Havana in 1966. His fluid, linear style and Cubist-like way of incorporating a profile into a full-faced figure led cartoonist Bill Griffith to dub him the “Picasso of the Caribbean” when the Zippy comic strip went to Cuba. In the past few years, he has transformed Jaimanitas by extending his artwork from his home (constantly growing with sculpture, tiles, paintings, studios) to entire streets and neighborhoods. One most recent addition is a permanent ceramic chess table and chairs, filled day and night with local players. In 2008, he inaugurated a large ceramic structure in honor of the “Cubans.” Fuster has had one-man shows in Cuba, Romania, New York, Italy, Spain, France, and the Dominican Republic, and participated in group shows throughout Europe, North and South America. Fuster (José Rodríguez Fuster) #6549. "Cuba si," N.D. Glazed clay. 9.5 x 6.5 inches. Fuster (José Rodríguez Fuster) #6514 Untitled, N.D. Ceramic sculpture. 13 x 3.75 inches. Fuster (José Rodríguez Fuster) #6513 Untitled, N.D. Ceramic sculpture. 14 x 5 inches. Fuster (José Rodríguez Fuster) #6515 (SL) Untitled, N.D. Ceramic sculpture. 12 x 5.5 inches. Fuster (José Rodríguez Fuster) #90. "La cuadra," N.D. Monotype print. 13.5 x 17 inches.